If you ask me, Transom does some of the best digital audio recorder reviews around. You know, not including my own. While Transom doesn’t appear to have gotten their hands on a Sony PCM-D50 yet, they did recently post a review of the much anticipated Marantz PMD620. And while it looks like an excellent recorder in terms of build and sound quality, there are a couple of drawbacks, not the least of which is that there’s an annoying latency issue when monitoring recordings with headphones. In other words, you’ll hear the recorded sound echo back to you a split second after it’s recorded. That means you’ll hear each sound twice unless you have amazing headphones that prevent you from hearing any sound from the outside world. I’ve updated my PMD620 review roundup to include some information from Transom’s review, but I highly recommend checking out the full review. 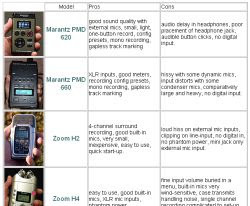 Transom has also updated their incredibly useful portable digital audio recorder comparison chart to include the PMS620. You can also get an overview of other popular recordings like the Marantz PMD660, Zoom H2, Zoom H4, Edirol R-09, M-Audio MicroTrack, Tascam HD-P2, and Sound Devices 722. Is it better to save USD100 buying USD400 Marantz PMD620 instead of buying USD500 Sony PCMD50? Although I would prefer a tiny flash recorder, with MP3 and monaural native recording, like Marantz PMD620, I think PCMD50 build and sound quality worth the small increase in price. Do you think Sony PCMD50 can suit stealth recordings with its size? Stealth recordings aren’t really my area of expertise, but if you’re planning on using the internal microphones on the PCM-D50, I’d say probably not. While you could certainly fit the recorder in a small bag or large pocket, the internal mics are pretty sensitive and likely to pick up a lot of movement noise. If you’re not planning on monitoring your recordings with headphones (ie if you’re recording concerts), then the PMD620 might be a better bet. It’s smaller, and while it does record some hiss, you’re not likely to notice this in a noisy envionment. If you want the best possible sound quality (for under $500), and plan to use an external mic, I think the PCM-D50 is a better choice. As an early adopter of the PCM-D50, I agree — the internal microphones are WAY too sensitive for that. Just on looks alone, get the SONY — every millimeter of it just yells quality. Remember that the PCM-D50 has 4G internal memory. The PMD620 comes with a 512K SD card (I think). So by the time you’ve upgraded the PMD620 with a 4G card (70 dollars?) the price difference is not so big after all.